We were approached by the estate of Barry Flanagan OBE, the Welsh sculptor best known for his enormous bronze hares to create an online archive of his work. Flanagan was a completist and his archive includes tens of thousands of documents overseen by three full-time archivists. 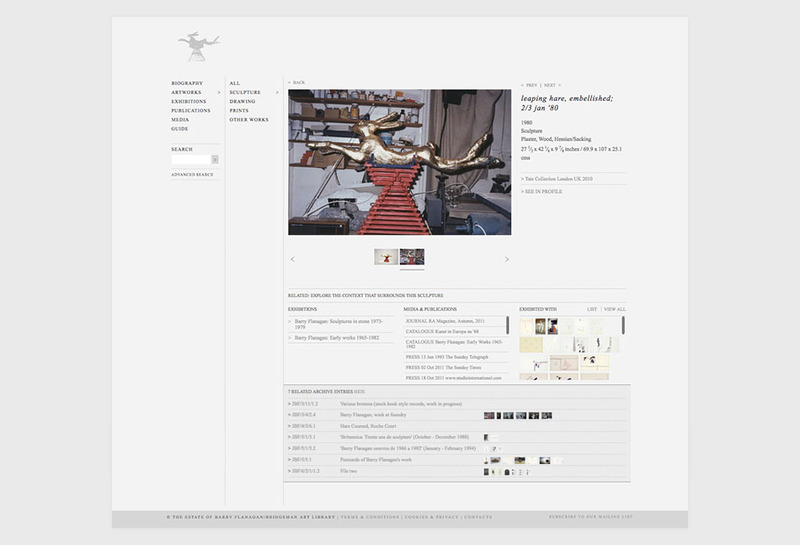 Fruitmachine produced a website that not only houses his artworks, photographs, sketchbooks, writings and personal papers, but also represents the first time an artists estate has produced its own archive. Working closely with Flanagan’s estate, we soon realised there was a richness to his archive that went far beyond a mere collection of objects. Each item was meticulously annotated and could be connected to many other items: works could be traced back to the sketches from which they were conceived, and forward through their appearances in exhibitions, broadsheet reviews and gallery catalogues, alongside associated private-view invitations, photographs and even diary entries. It was a vast, complex web of material that could be categorised, signposted and navigated in a near-infinite number of ways. First, we agreed with the estate that when planning to place all of these items online for the first time, it was essential to document everything to an archival standard – sketchbooks, diaries and papers would be scanned and available to view in high resolution. The site would be a definitive tool not only for the public but also for the academic community. We wanted to offer visitors multiple ways to explore and understand the archive, from the sweeping (browse the late 1970s) to the specific (track the history of a single work). Lastly, the estate remained active not only in managing the archive, but in keeping Flanagan’s legacy alive through ongoing exhibitions, restoration of works and sales to collectors, and it required a robust, customised workflow management tool for its day-to-day activity. 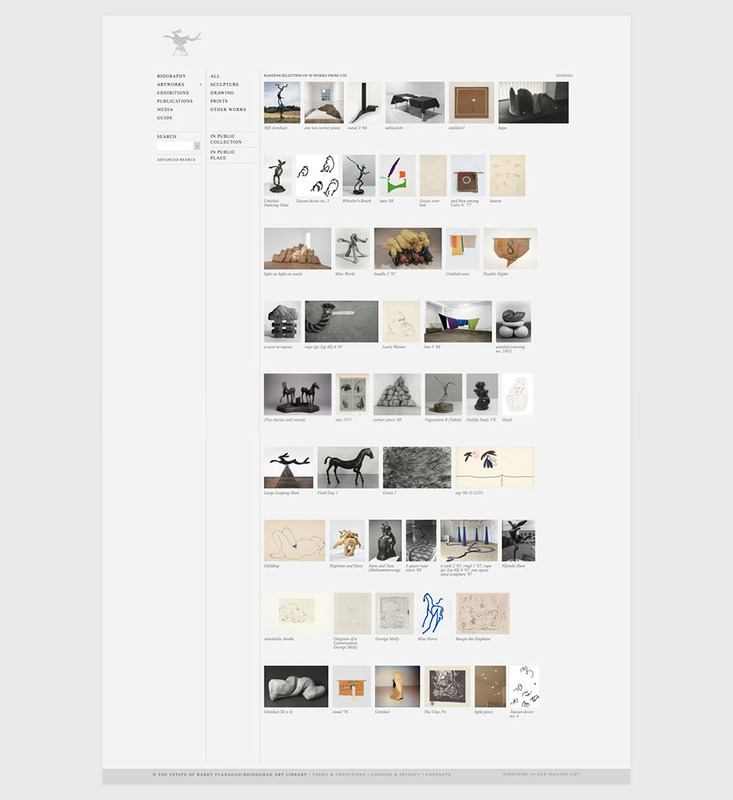 The website is divided into two sections: Artworks and Archive. 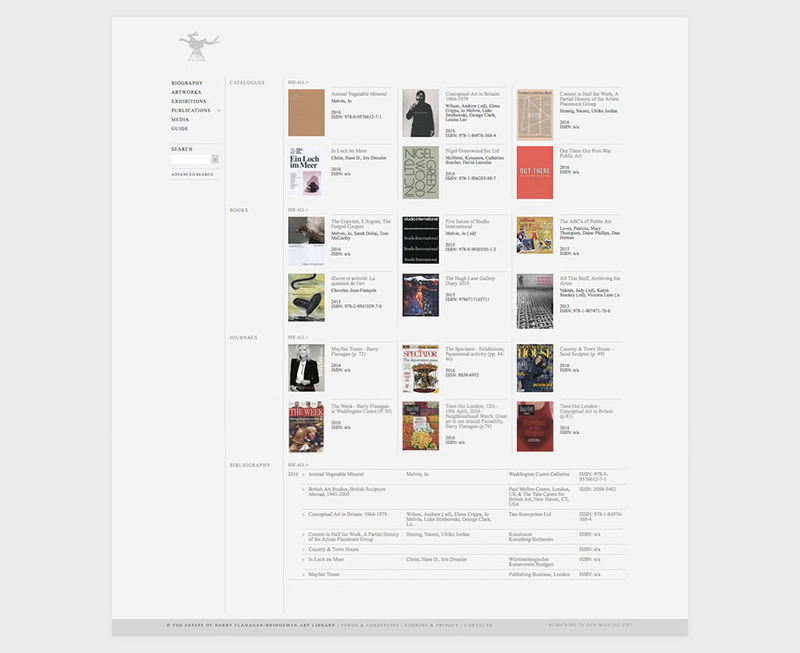 Artworks is a catalogue raisonné – a comprehensive catalogue. 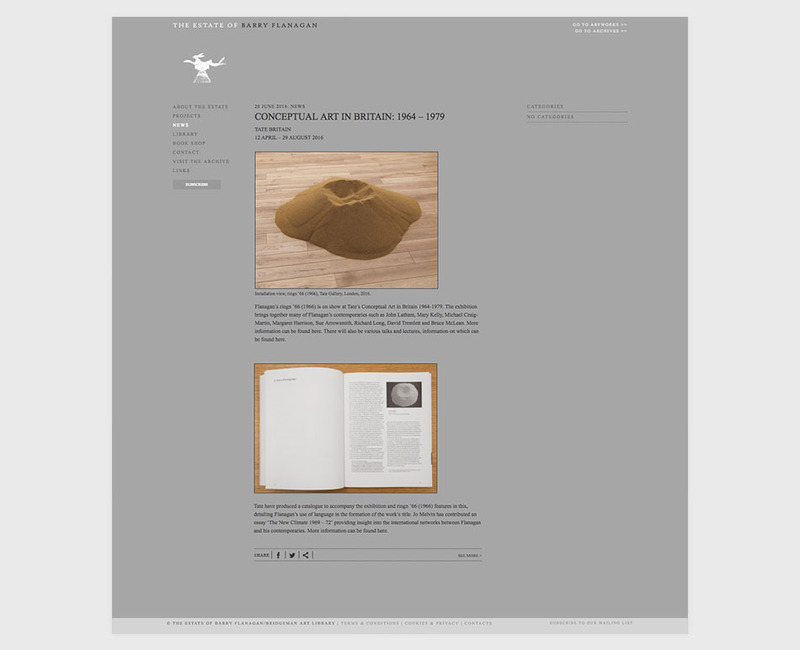 Clicking on one work brings up not only images of it and basic details (media, year), but a list of every exhibition and publication in which it has appeared, and which other works it has been exhibited alongside. In the Archive, which is also fully cross-referenced with the Artworks section, visitors can dive more deeply into supporting material, tracing a single work back to original sketches, viewing an invoice for its casting, or seeing a mention of it in Flanagan’s diaries. Each item in the Archive is thoroughly annotated – one text next to a diary page reads, “Meetings with ‘Christopher Cook’, Katherine Porter [writer], Ron Bishop [writer], John and Myfanwy Piper [both artists and writers] and a pen drawing of a map”. 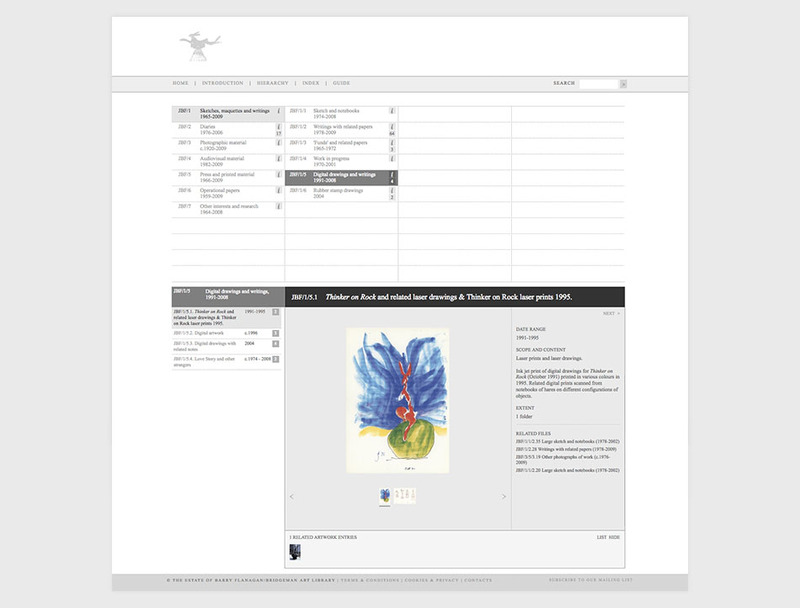 We created a Filemaker system to host the site content and to manage the day-to-day operation of the estate – his archivists can edit and track each work, add entries for new editions, and record sales, transportation to exhibitions and restoration and maintenance status. We contracted Holster Media to develop this functionality. We also created all branding and design for the estate. The logo, a hand-shaded illustration of one of Flanagan’s beloved Large Leaping Hares which reside in public spaces around the world, immediately signals a step back in time to the era that shaped Flanagan’s work. The design of the site is understated, but with its serif type, quirky use of capital letters for emphasis and subtle colour fields which guide visitors through complex hierarchies of information, it is more reminiscent of leather-bound volumes in a wood-panelled library than of a ruthlessly efficient data delivery system. We hope it reflects the idiosyncracy, playfulness and attention to the tiniest of details that characterised Flanagan himself.